This adorable little plush cow backpack clip stuffed animal from the Cheery Clips collection will brighten your day as you take the cheerfulness of Cheery Cheeks on all your adventures. You'll love the soft white fur, pink muzzle, embroidered details (including black eyes, blue eye spot, orange cheek spot, and sweet smile), black ears (one with a black and white striped inner ear), yellow horn buds, floral-on-black-background corduroy tummy, and fun and floppy black and white rope legs. Complete with turquoise backpack clip for attaching to backpacks, purses, belt loops, and more, this Cheery Clips Cow plush backpack clip stuffed animal is great for on-the-go adventure as well as birthday treat bags, prizes, and giveaways. This cheerful plush horse backpack clip has soft light brown fur, floppy dark pink mane and tail, and cute smile. This cheerful plush cat backpack clip has soft pink fur, floppy hot pink and teal rope legs, and a never-ending smile. 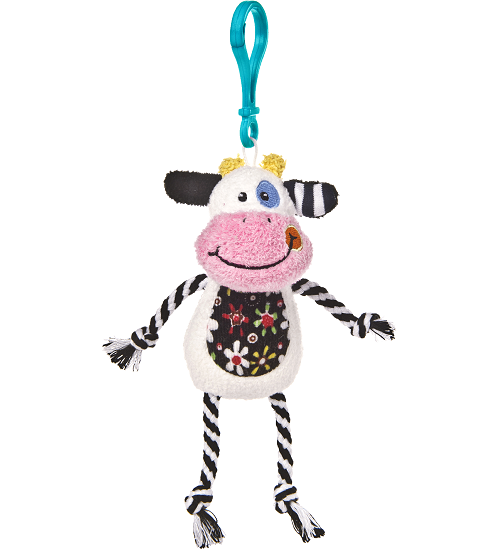 This cute little cow plush backpack clip has soft black and white fur, felt horn buds, and sparkly dark pink eyes.